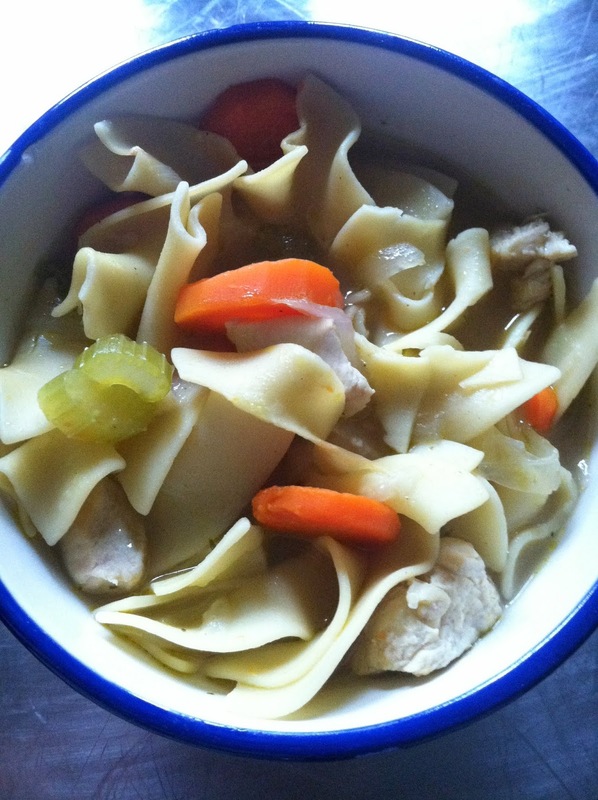 I first wrote this title as “Chicken Noodle Coup”, and almost kept the spelling error. This was one of the first things I ever learned how to “make”, and make is in quotes because it’s so delicious that it’s almost unfair how simple it is to throw together. It was my mom’s go-to recipe whenever my sister and I were sick growing up, and now it’s mine! This is everything you’d expect comfort food to be – healthy, simple, full of flavor, and it warms you so much that you can almost feel it fighting off your cold. 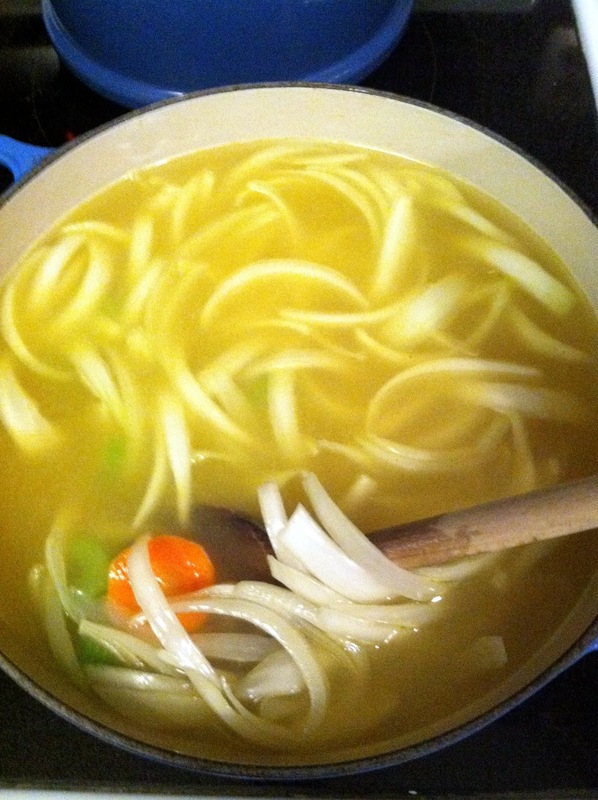 I like a lot of noodles in mine, and I’ve found that egg noodles are the best, but if you add them directly to the soup as it’s cooking, they’ll continue to soak up the broth when the rest goes in the fridge. So, either cut back on the amount of noodles you add, or cook them separately and add to the soup as you reheat it. 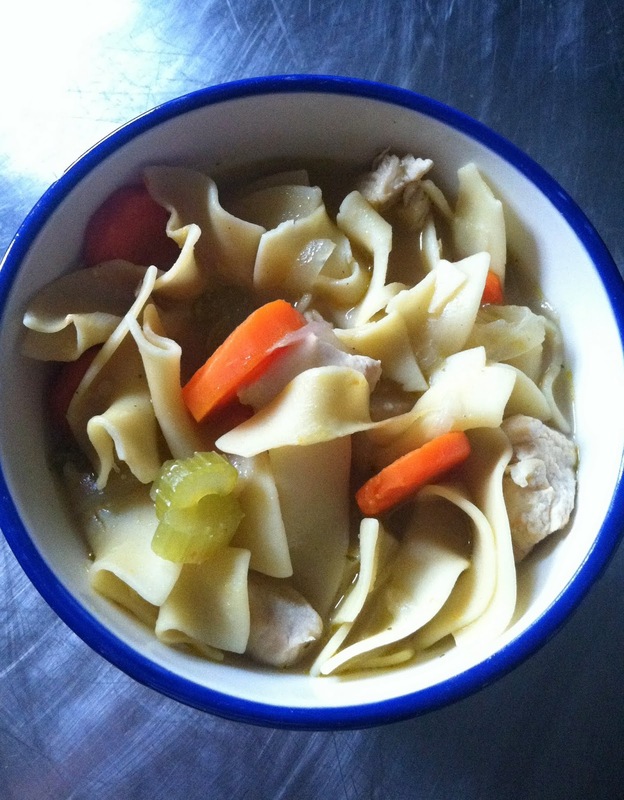 – egg noodles – I usually use about half a bag, but adjust this to your preference, too. 1. Melt 1 tbsp. butter over medium-high heat in a soup pot or – as always, a trusty Le Creuset Dutch Oven. 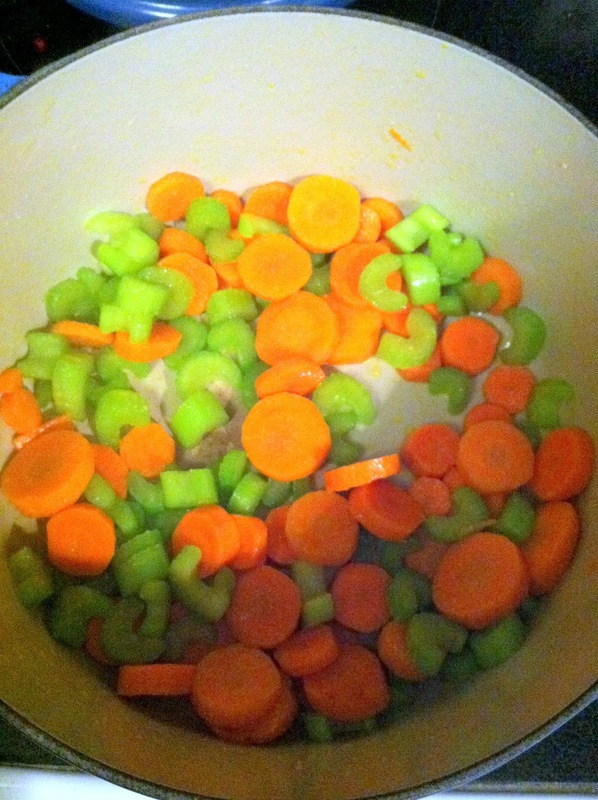 Slice the carrots and celery, and add them to the pot when the butter is melted, stirring occasionally (don’t let them brown. A little kosher salt added to the veggies will help them “sweat” instead of brown). 2. 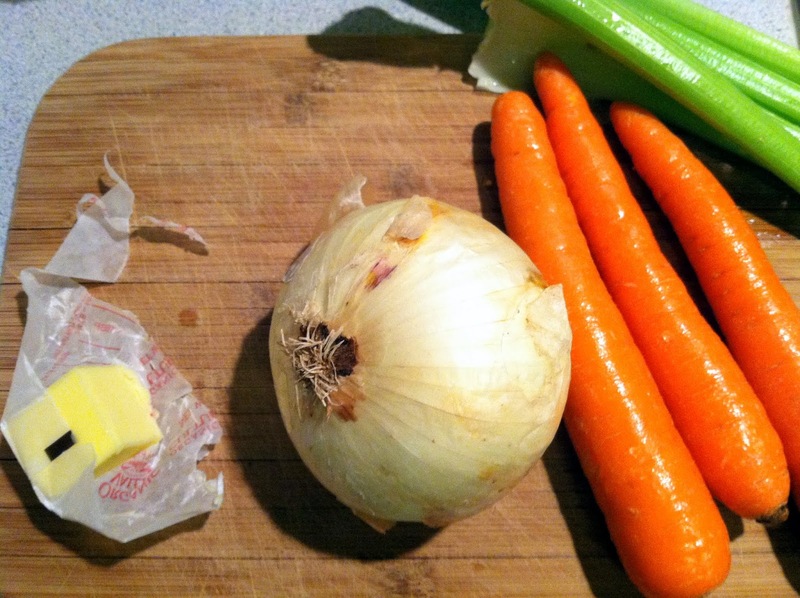 When veggies have sweated a little, add the broth and the onions. Sweating the carrots and celery before adding the rest of the ingredients gives them a little head start, since they’re firmer than anything else that will be added to the soup. 3. Raise temperature to high and get the soup to boil, then cover and lower to a simmer. Simmer soup for approx. 20 minutes to allow the flavors to mingle, then add the bouillon cubes. Stir well to break up the cubes and allow the flavors to release. Add the dill, stir to combine. 4. 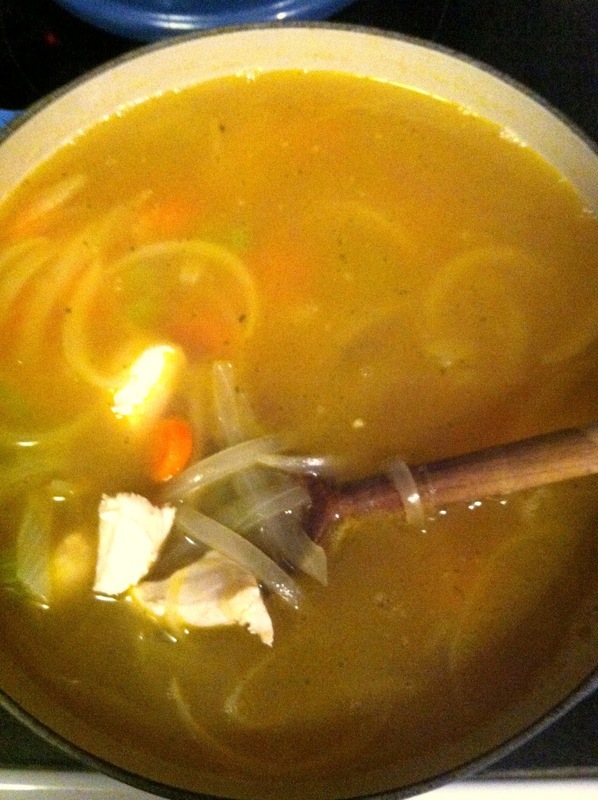 Raise soup to medium heat again, and add the chopped chicken. You’re basically poaching the chicken in the soup broth, so it will cook pretty quickly, approx. 6 minutes. Reduce heat to a simmer again. 5. Add the noodles to the broth, stir, and allow to cook. 6. Season to taste, help yourself to a bowl, and feel better. Soup the next day – you can see how the noodles really soak up the broth! 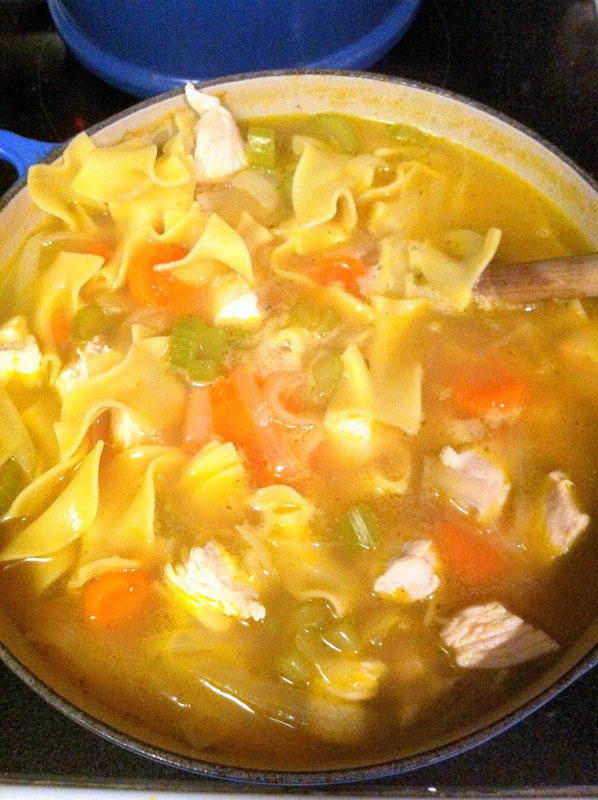 This entry was posted in chicken noodle, mom, one-pot, soup on November 24, 2012 by westyn.